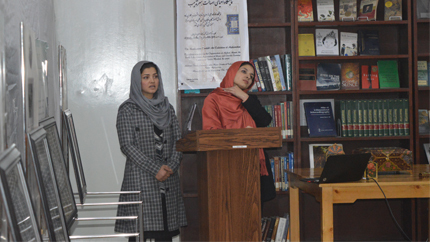 Afghan YSEL Alumna Yalda Mushref speaks before an audience at Kabul University on the artistic tradition of Tazhib and its historical significance in Afghanistan. Yalda Mushref, an alumna of the Youth Solidarity and English Language (YSEL) program, is sparking a new conversation by calling on fellow Afghans to preserve cultural heritage, specifically Tazhib, a historic Islamic artistic tradition. On December 17, 2014, Yalda, in collaboration with the Organization of Afghan Alumni (OAA), hosted an Islamic art exhibition at Kabul University which showcased the beauty and intricacy of Tazhib, also known as gilding. She displayed more than a dozen pieces of her artwork — gilded images of Arabic calligraphy — to an audience of over 100 individuals including alumni, students, and lecturers at Kabul University’s Faculty of Fine Arts. As attendees browsed the expansive collection, Yalda detailed the origins of Tazhib. Derived from the Arabic word “zahab”, which means “gold”, Tazhib is the art of adorning books with delicate, decorative patterns. Originally, Tazhib artists, often called illuminators, crafted geometric flourishes and plant patterns in the color gold, hence the linguistic root of Tazhib. She explained that the linguistic roots of the word Tazhib in Arabic pointed to the deeply ingrained cultural and religious expression of this tradition across the centuries in Afghanistan, from designs that line pages of Persian poetry books to the tiles that decorate the Shrine of Hazrat Ali in Mazar-e-Sharif.